If you want to have power when and where ever you are then you need this Phoenix portable generator from Renogy. The Phoenix is a black suitcase and inside it, there is a 16Ah Li-ion battery that is replaceable. 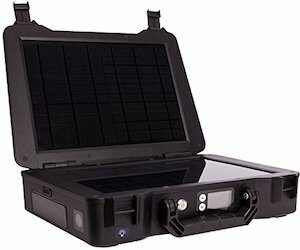 And when you open the lid you will find 2 10 watt solar panels and you can expand that to 120watt of solar. And besides the sun you can charge this suitcase through AC or the car cigarette lighter. And then when you need power you can get it through one of the many ports, there are 4 USB, 1 AC, 2 DC, and 1 cigarette 12v car port. Now you are all set for when the power goes out or is unavailable so order your Renogy Phoenix Portable Generator. We all carry around all those gadgets that need power. And now you can make them all charge while on the go. This power bar plugs into you car cigaret lighter and then offers two power sockets for things like a dvd player or laptop and besides the power ports there are also two USB ports so that you can charge a phone or tablet. Now you are always ready to get your devices charged. 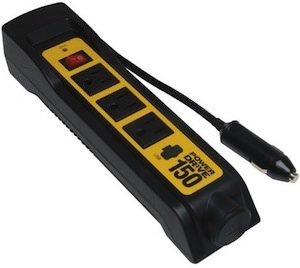 Come see how much of your devices can be handled by this Smart Car Inverter Power Bar With USB. 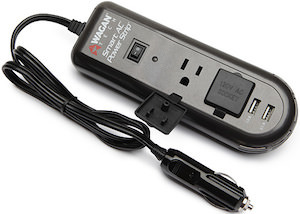 Need more power for all your gadgets in the car? Look no further because here you have it all in one cup holder size container you will get two USB ports and two power sockets. You see this way you can charge almost anything while driving along. 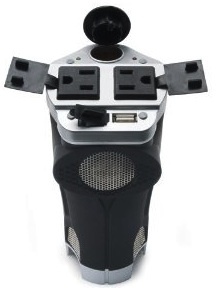 Go check out this Cup Holder USB Power Inverter.